24 Seventy weeks are decreed about your people and your holy city, to finish the transgression, to put an end to sin, and to atone for iniquity, to bring in everlasting righteousness, to seal both vision and prophet, and to anoint a most holy place [literally holy of holies]. 25 Know therefore and understand that from the going out of the word to restore and build Jerusalem to the coming of an anointed one, a prince, there shall be seven weeks. Then for sixty-two weeks it shall be built again [or there shall be seven weeks and sixty-two weeks. It shall be built again] with squares and moat, but in a troubled time. 26 And after the sixty-two weeks, an anointed one shall be cut off and shall have nothing. And the people of the prince who is to come shall destroy the city and the sanctuary. Its end shall come with a flood, and to the end there shall be war. Desolations are decreed. 27 And he shall make a strong covenant with many for one week, and for half of the week he shall put an end to sacrifice and offering. And on the wing of abominations shall come one who makes desolate [or at the temple he will set up an abomination that causes desolation] until the decreed end is poured out on the desolator. 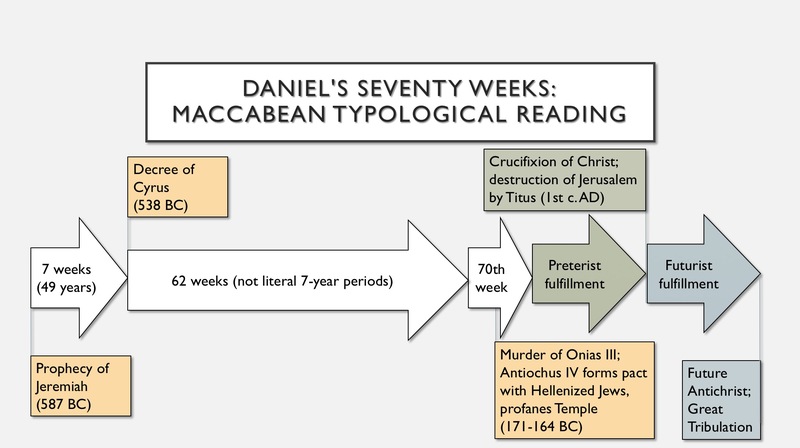 As I tell my students, Daniel’s Seventy Weeks just might be the most complicated, confusing, and controversial prophecy in the entire Old Testament. These four short verses have provoked countless debates, which show no signs of abating anytime soon. But at the very least, we can work toward understanding what all the major options are. How long are the “weeks”? Are they exact seven-year periods, are they symbolic, or are they approximations? When do the seventy weeks begin (i.e., what is their terminus a quo)? What (or who) is the “most holy place”/”holy of holies” (v. 24)? Who issued the word to restore and build Jerusalem, and when (v. 25)? 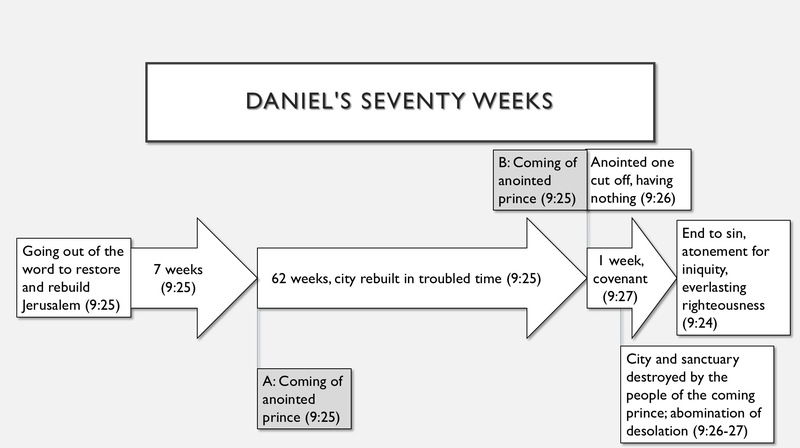 Who is the “anointed prince” (v. 25)? Who is the “anointed one” who is “cut off, having nothing” (v. 26)? Is it the same as the anointed prince of v. 25, or someone else? Who is the “prince to come” whose people destroy the city and sanctuary (v. 26)? 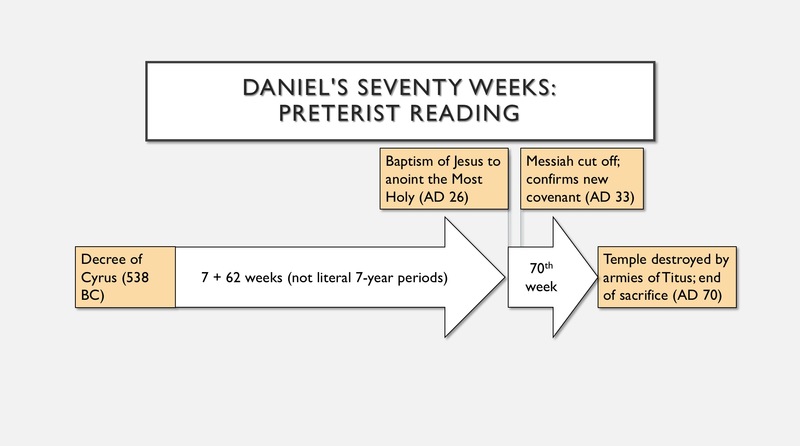 Is there a chronological “gap” between the sixty-ninth and seventieth week? Who is the “he” who makes the “strong covenant” (v. 27)? Is it referring back to the anointed one, or to the coming prince? What is the abomination of desolation (v. 27)? When do the seventy weeks end (i.e., what is their terminus ad quem)? 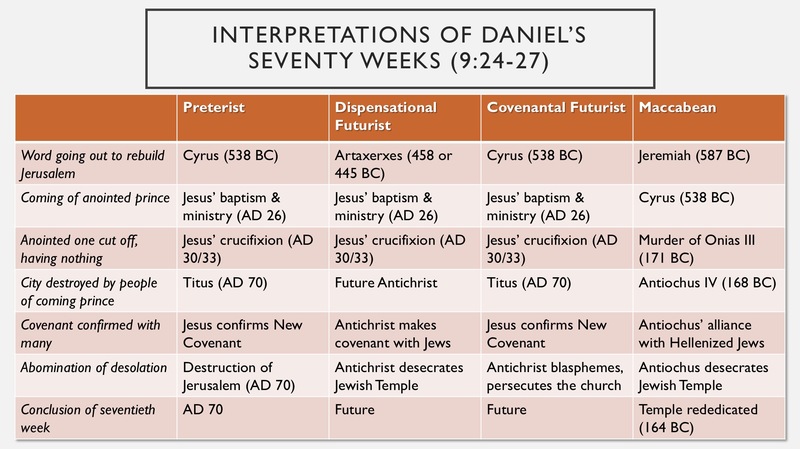 While the details vary from interpreter to interpreter, the options can generally be boiled down to four major views: 1) Preterist, 2) Dispensationalist, 3) Covenantal–Futurist, and 4) Maccabean–Typological. 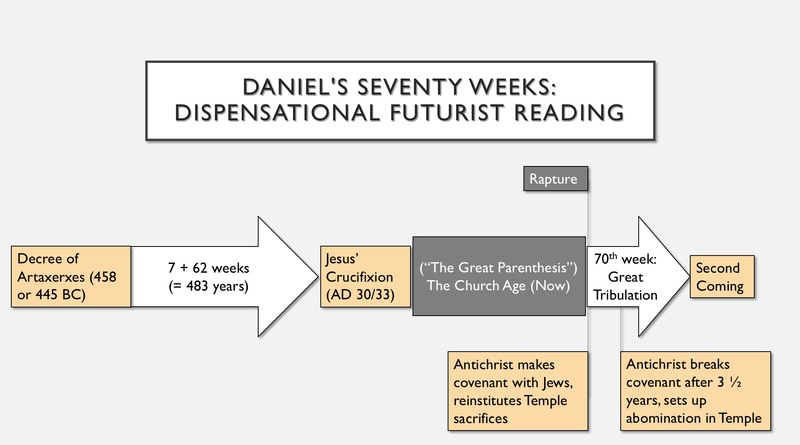 If you’re wondering where I land personally, I started out leaning toward the covenantal-futurist view, but now I think I favor the Maccabean-typological reading, mostly because the prophecy fits so well with events surrounding the reign of Antiochus IV. Also, typology allows us to combine the strengths of the other views through multiple levels of fulfillment, without tying us to an awkward or contrived chronological scheme. Robert Chisholm makes a persuasive case for this view. The biggest weakness I see here is the sixty-two weeks: it turns out to be 367 years, not 434 years. On the other hand, none of the views is completely free of chronological difficulties. 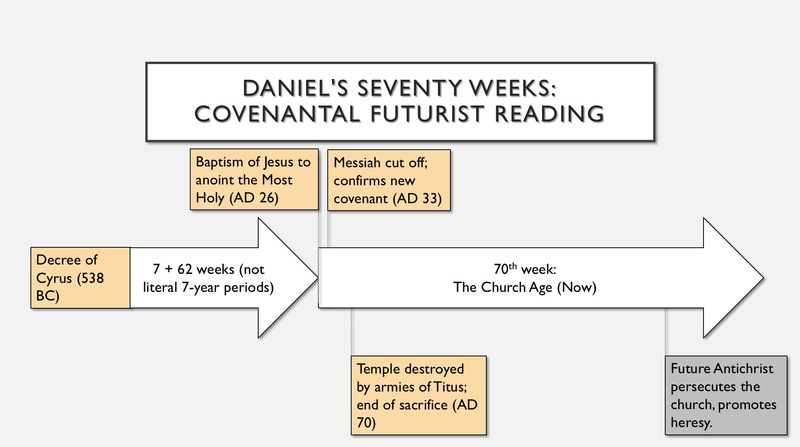 There’s nothing in the text to suggest a gap between the sixty-ninth and seventieth week (contra dispensationalists), nor does there seem to be any compelling reason to think that we’re still in the second half of the seventieth week (contra covenantal-futurists). 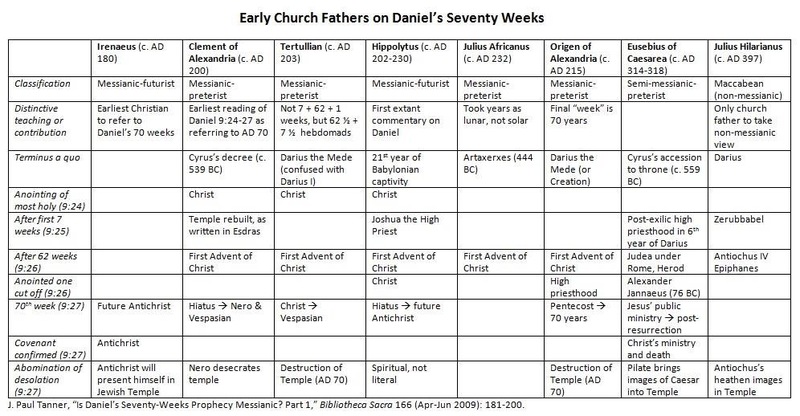 I think preterists get us a bit closer to the mark, but even they have to stretch the seventieth week from Christ’s death (AD 33) to the destruction of the Temple (AD 70). 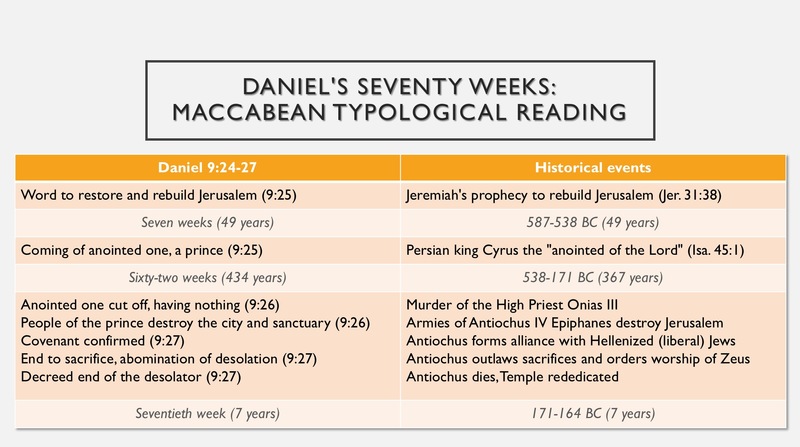 So all things considered, I think that the Maccabean reading makes the most sense. You have done a lot of work here. Thanks. But I am a bit curios about the places where you list Jesus’ baptism as AD 26 and then his death at AD 33. Wouldn’t those who hold these views also hold either AD 26/27 and 30 OR AD 29/30 and 33 given the fact that many posit a three year or so ministry for Jesus? Yes, you’re right. 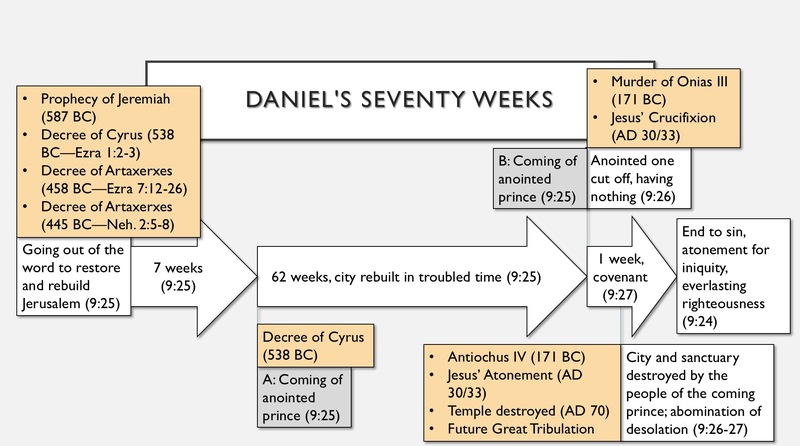 I’ve compiled a number of different sources, and for some reason the favored date for the beginning of Jesus’ ministry is AD 26, while the favored date for the Crucifixion is AD 33. But technically you’re right, if Jesus’ ministry was three years then those two dates don’t go together. See them instead as the maximum window on Jesus’ public ministry.